We always teach our students that martial arts is about more than just kicks and punches. Well, show them how this month with these mat chat cards about sharing. Download the Free Resource Now. Martial arts is a valuable activity. The self-defense you teach in class is one of those things your students will no doubt need at some point in life. But you know what is more valuable and can have an even bigger impact? Life skills. Teaching a student how to throw a hook or kick is one thing, but teaching him or her how to do a little bit better in life — that's the ultimate gift you can give them. 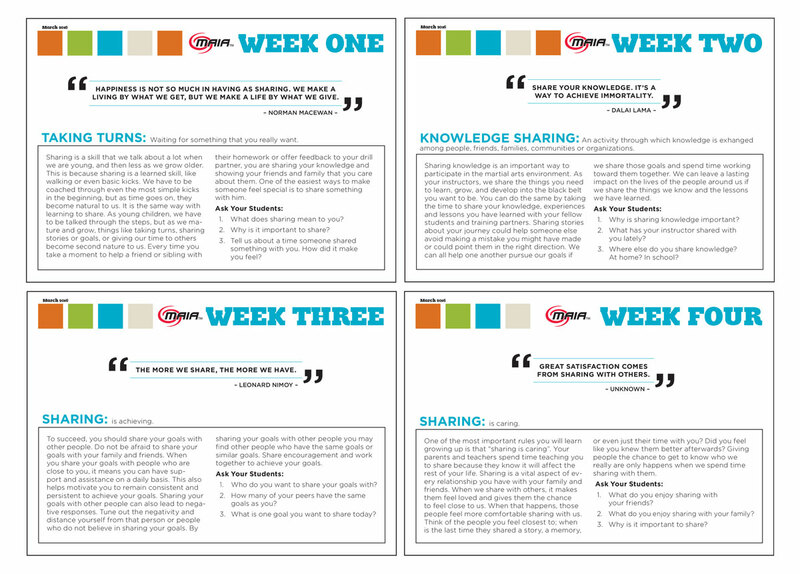 That's why in this month's free resource, we're going to give you 4 weeks of mat chats about sharing. This will help you demonstrate more value to your students and their parents, but more importantly, it will impact someone else's life. Use these every week for the month of March and teach your kids a valuable life lesson - sharing. You can download them here now.